Chuck works in Facility Operations and has been a Nationally Certified & IL Licensed Massage Therapist since 1998. 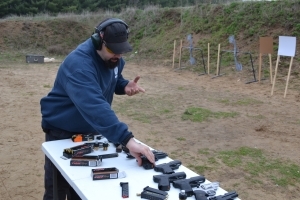 His passion for teaching (Massage Therapy Program Instructor) and experiences as a workplace trainer carry directly over to his role as a firearms instructor. He began his training with Fortress Defense in 2011, quickly acquired his NRA Instructor Certification and DTI Instructor certifications. Chuck continues his training and education on a regular basis with many renowned personal defense instructors nationwide.